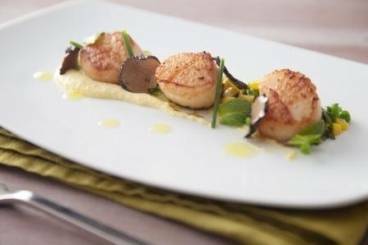 Seared scallops with a sweet corn puree, fresh minty marinated corn and peas and woody fresh black truffles. Clean the scallops by washing under cold water. remove the skirt and orange coral. Dry on kitchen paper. Heat a frying pan until very hot. Add the oil, season the scallops and cook for 1 minute on each side until golden brown. Finish with a knob of butter and a squeeze of lemon. Peel and finely dice the shallots and puree the garlic. Cut all the kernels off the sweet corn and save some back to marinate. Sweat the shallots, garlic and sweetcorn in a sauce pan with the butter. Season well, add the double cream and cook until the sweetcorn are soft. Puree in a blender and then pass through a fine sieve. Pod the peas and cook in boiling water with the left over kernels of corn. Place directly into iced water to retain the color. Finley slice the mint, zest and juice the lemon. In a small pan, warm some butter, add the corn and peas and gently heat. Finish with fresh mint and lemon zest and a little bit of lemon juice to taste.